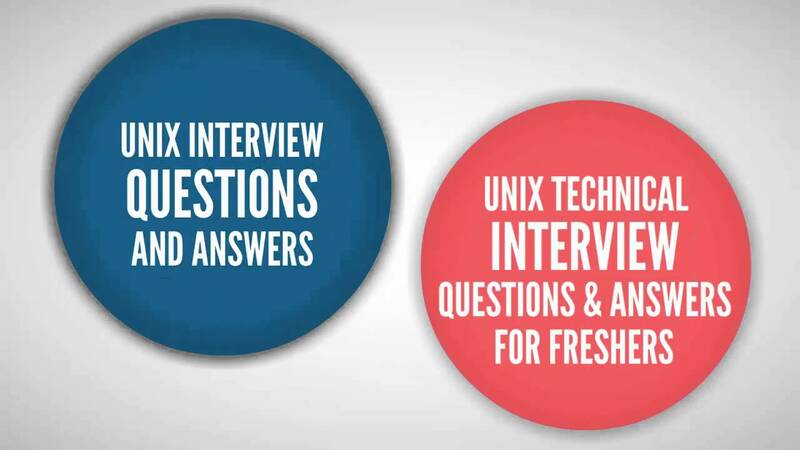 In my previous articles i have explained about different UNIX tutorials with real life examples.I would like to give the set of different Unix Scripting Interview Questions which is useful for freshers as well as experienced UNIX developers or support engineers.These Unix Scripting Interview Questions are important to measure the knowledge of the person theoretically as well as practically.Unix operating system is one of the most used and secure operating system which is using in development and deployment of lot of applications.Because of the Security of the UNIX operating system this is used in 90 percent of applications as a server operating system.Unix is Multi-user and Multitasking operating system which is used mainly as server in most of the applications. nix operating system is one of the most used and secure operating system which is using in development and deployment of lot of applications.Because of the Security of the UNIX operating system this is used in 90 percent of applications as a server operating system.Unix is Multi-user and Multitasking operating system which is used mainly as server in most of the applications. Shell is an interface between the user and the kernel. Even though there can be only one kernel; a system can have many shell running simultaneously. So, whenever a user enters a command through the keyboard, the shell communicates with the kernel to execute it and then display the output to the user. ksh – This is called as Korn shell. This is developed by David Korn. Bsh- Bourne shell. This is developed by Stephen Bourne. Bash- This is mostly used shell in Unix operating system. Bourne Again shell is most used for shell scripting in Unix operating system. 4.If user wants to display current user information which command is useful? This command displays current user information. 5.Which command is useful to show present working directory? PWD is most commonly used command which is used to show the present working directory of the user. 6. What is the difference between soft and hard links? Soft links are link to the file name and can reside on different filesytem as well; however hard links are link to the inode of the file and have to be on the same filesytem as that of the file. Deleting the original file makes the soft link inactive (broken link) but does not affect the hard link (Hard link will still access a copy of the file). 7.How to display Calendar in Unix? Explain with different examples. Cal command is used to display the calendar in Unix. Following are its different examples. Cal command displays the current month calendar. Displays the 2000 year calendar for month of January. 8.How to switch from one user account to other user account in Unix? The SU (Super user command) is used to switch from one user account to another user account. the above command switches account named “Amit” to account named “Rohit”. 9.What UNIX operating system command would you use to display the shell’s environment variables? Running the “env” command will display the shell environment variables. It would also be good to understand the purpose of the common shell environment variables that are listed in the env command output. 10. What is the significance of $#? $# shows the count of the arguments passed to the script. 12.What is the difference between $* and $@? $*: $* will consider the entire set of positional parameters as a single string. 13.What needs to be done before you can run a shell script from the command line prompt? You need to make the shell script executable using the UNIX chmod command. You can optionally use octal notation to set UNIX permissions using the chmod command (e.g., $ chmod 755 example1). This topic is beyond the scope of this article, but you can find more information by entering “Unix file permissions chmod numeric notation” in your favorite search engine. 15.What are the responsibilities of a shell? 16.Explain how to create file using CAT command in Unix? User can create a new file using ‘Cat’ command in unix.Using shell prompt directly user can create a file.Using ‘Cat’ command user will able to open a specific file also.If user wants to process the file and append data to the specific file use ‘Cat’ command. After Completion of your text you need to press Control + d which is used to save the file and come out of the prompt.The above statement will create a file named ‘Amit_new.txt’. 17.Explain the significance of touch command in unix? touch command is used to create the empty or zero byte file,touch command also used to update the access or modification time of the file.touch command is basically used to create multiple files in linux or unix.using Cat command one can create or update one file at a time but using touch command user can only create multiple zero byte files but can not update multiple files at a time. The above command will create 2 zero byte files named Yodhini and Amit. rm Command is used to delete file in Unix. $ rm –i :- To delete a file with permission/confirmation. E.g:- $ rm –f File_Name. rm command is used to delete multiple files at a same time. 20.Explain echo and printf commands in unix? Using Echo as well as printf command user can create file in unix. \n is used as new line character which will create more than 1 lines of the file. 21.What is difference between absolute path and related path? 22.What does (.) And (..) means in unix? In UNIX, (.) means the current directory, so typing cd . This may not seem very useful at first, but using (.) as the name of the current directory will save a lot of typing. (..) Means the parent of the current directory, so typing cd .. Will take you one directory up the hierarchy (back to your home directory). 23.What is the UNIX command to list files/folders in alphabetical order? 24.What code would you use in a shell script to determine if a directory exists? The UNIX test command with the -d option can be used to determine if a directory exists. If the value stored in the variable mydir exists and is a directory file, the command(s) located between then and fi will be executed. You can consult the test command’s man page (“$ man test”) to see what test command options are available for use. 25.Describe links and symbolic links in UNIX? The second name for a file called a Link. It is used to assign more than one name for a file. It is not valid to assign more than one name to a directory or to link filenames on different computers. A symbolic link is the files that use to contain only the name of other files include in it. Directed to the files pointed by it is the operation of the symbolic link. 26.Explain about “s” permission bit in a file? 1.“s” bit is called “set user id” (SUID) bit. 2.“s” bit on a file causes the process to have the privileges of the owner of the file during the instance of the program. executing “passwd” command to change current password causes the user to writes its new password to shadow file even though it has “root” as its owner. These are the processes which have died but whose exit status is still not picked by the parent process. These processes even if not functional still have its process id entry in the process table. user can create the directory using Mkdir command in unix. The above statement will create directory in usr/bin folder.Mkdir command produces no output if successfully created directory. 30.How to create Parent Directory in Unix? Sometimes user wants to create a directory where the specified directory is not exist.Means user is trying to create parent directory. If user is facing above error then user needs to use -p option which is used to create parent directory and all the necessary directories directly. The above statement will create the directory named ‘Pradnya’ in tmp folder and ‘Unix’ in ‘Pradnya’ folder. 31.How to remove directory in Unix? To remove directory user will have use rmdir command which stands for ‘Removing Directory’.Before removing directory user needs to check that the specified directory is empty or there is no any file or subdirectory inside that directory. The above statement will remove the directory named ‘Amit’. 32.How to change directory in unix? One of the most used command in unix is Cd which changes the directory path.User can be able to go to any specified path using cd command. directory path is path of directory which you want to change. The above statement will go to the bin directory and user will able to work in ‘Bin’ Directory. Once above command is executed, you will be asked to enter the password. 34.If there are 2 files. How to print the records which are common to both? unique to 1st and 2nd file respectively. 35.How do you access command line arguments from within a shell script? Arguments passed from the command line to a shell script can be accessed within the shell script by using a $ (dollar sign) immediately followed with the argument’s numeric position on the command line. For example, $1 would be used within a script to access the first argument passed from the command line, $2 the second, $3 the third and so on. Bonus: $0 contains the name of the script itself. 36.How to rename directory in Unix? Using mv command user will rename the directory name. The above mv statement is used to rename the directory named ‘Amit’ to ‘Pradnya’. 37.How to create hidden files in Unix? Any file_name/directory_name starts with ‘.’ is hidden file/directory. 38.What are different types of permissions in Unix? Group permissions are Unix File Permissions to specific group of users to open,read,write and execute the file. These are Unix File Permissions to other user to perform open,read,write, execute file permission. 39.If user wants to give all permissions to file which command is useful? It gives Read Permission to User, Read/Write/Execute Permissions to Group & Others. 40.Give me different commands to set different permissions to the file? 41.What is Grep Command in Unix.Explain with exmaple. Grep Command which is used to search file or directory or string in a File or directory in unix operating system.Grep command actually searches the file which has the given pattern.Grep command is also used to search the string or regular expression in given file or files. $grep options [Pattern] File1….File n.
42.How to search given string in the file? You can directly search the specified string in a file using grep command.But make sure that the searchis case sensitive and the string which you want to search is also case sensitive. It prints the line containing complexsql. It searches ‘Complexsql’ string in file1, file2 & file3 files and print those lines. It searches the Complex string in current directory all files. 43.Which option is used for case insensitive search in Grep Command? The Grep also used to search the string which is used for case insensitive search. We need to use the option named -i for case insensitive search. The above statement is used to fetch the lines which has complex word whether it is capital letters or in small letters. 44.How to count number of lines in file? Using Grep Command user can count the number of lines which is having that specific string. 45.How to print lines with line number in Unix? grep command is used to print the line with line number using -n option of Grep command. 46.How to search file which contains specific string name? Grep command is also used to search the filename which contains the specific keyword.The option -l is used to search the filenames which contains that specific string. 47.Give the Grep command examples with specific character pattern search? 49.What is fgrep command in unix? It is used to search multiple strings, but it doesn’t allow searching regular expressions. It searches the strings faster that the grep. 50.What is egrep command in unix? It is combination of grep&fgrep plus some additional wild card characters. 1) (|): It matches any one string in the given list. It prints line containing Hari, Oracle or 103 from Student file. Hope you like this article of 50 most important unix interview questions and answers with example.Please comment in comment section for different suggestions.